Members of the Charles and Polly Ann Hicks Preserve join attorney and host James Lewis on this episode of Lewis On The Law, entitled The Hicks Preserve - A Heirs Property Case Study. Born a slave, Charles Page was born on a plantation in Johnson County, Georgia, in 1838. In 1860 his first master, a brutal man, sold him to a retired U.S. Army major, James H. Hicks Sr. In accordance with the custom of those days, Charles Page took the last name of his new master and became Charles Hicks. Charles later moved to a farm near Lyons, Georgia in the 1890s where he met and married Polly Ann Banks on June 15, 1900 in Montgomery County, Georgia. Polly Ann became a prominent mid-wife and delivered babies for many years. She delivered both so called “colored” babies and white babies and was well known, loved and remembered by each of them. Many of the babies she delivered, grew up and attended Hicks family events until they became elderly and passed away. In the early 1930’s, Charles and Polly Ann purchased a sizable parcel of land and designated a portion for the purpose of building a church, establishing a cemetery and providing classroom space for the very first school to educate colored children in the local Toombs county area. Charles passed away in 1938 and Polly Ann held on to the family farm until her death in 1974. After her death and lengthy court proceedings, all of the land, except the church and cemetery, was divided into six parcels and awarded to their six surviving children. The siblings unanimously agreed to deed the church and cemetery property to the Jordan Stream church. However, Jordan Stream church was never formed as a legal entity, merely a name. Thus, the church was unable to own any property. The church property, including the cemetery, is considered heirs property. Because of the number of heirs, the small size (and condition) of the parcels (approximately 10 acres, including the church and cemetery), the amount of previous tax expenditures and the high cost of legal fees, the estate does not offer any monetary value. However, anyone reading about the rich legacy of Charles and Polly Ann Hicks, should agree this project is priceless. Charles Page was born a slave in Johnson County, Georgia, in 1838. He served in both Armies (Union/Confederate) during the Civil war.Polly Ann was a prominent mid-wife. Experts say “You need to think 20, 50 years down the road – will anyone still be able to find the Jordan Stream cemetery or any of the graves?” They also say “If you don’t take care of this now, there will become a time when it’s too late." Registration allows the Organization the opportunity to communicate important updates and to expeditiously put measures in place to protect the legacy of Charles and Polly Ann Hicks. Without the full cooperation of every family member involved, this urgent crisis will become even more difficult. We highly urge all direct descendants of Charles and Polly Ann to complete a Descendant Registration form. By registering as a descendant of Charles and Polly Ann Hicks, you will receive regular communications from the Charles and Polly Ann Hicks Preserve initiative. In addition, you will be included on the Hicks Family Tree canvas scheduled to be permanently displayed in the sanctuary of Jordan Stream Baptist church. Please make each entry as accurate as possible for verification purposes. NOTE: Personal information collected will be protected with complete privacy, never shared, sold or mishandled and will only be used for the purposes previously listed. 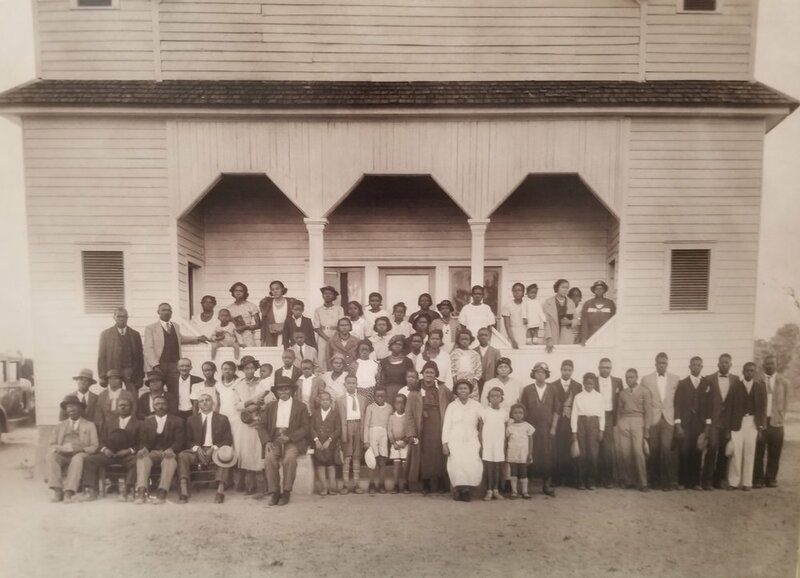 The original congregation/student body of Jordan Stream Baptist church and first colored school in the early 1030’s. Since the early 1960's, membership of the Jordan Stream church steadily declined until February 2018, when services were suspended indefinitely due to an insufficient number of active members to sustain normal operations. As a result, the resources needed to provide perpetual care to the church cemetery were no longer available.